new songs and old hits. And he sang a Carinthian song with the audience. When someone stands on stage who isn't just able to sing, whistle and play wonderfully, but also knows how to yodel superbly, they can only be Hubert von Goisern. The yodel, a kind of primal scream, is well known as the source of his success and a central element in many songs. Between Bolzano, Stuttgart and Vienna, the exceptional Upper Austrian musician made a stop in the not acoustically ideal Villach Stadthalle and delighted his Carinthian fans on his extensive tour. 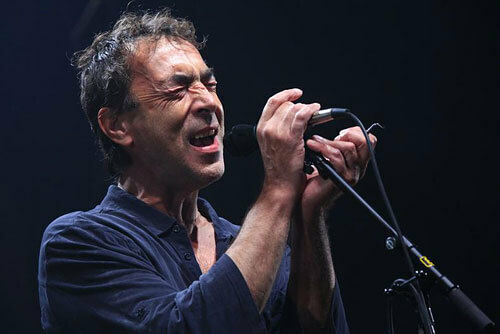 For although he will - one can hardly believe it - turn 60 in mid-November and has been on stage for more than 30 years, he has lost none of his verve, his youthfulness and individuality, his charisma and in particular his musicality. Hubert Achleitner from Bad Goisern and his powerful and funky band sparked the trademark sound mixture that made him famous: the alpine rock that he created. Blues, jazz, rock and reggae are mixed with alpine sounds and world music borrowings. In this conglomeration no instrument was safe from him. Jews; harp, guitars, harmonica and various accordions (which are all incidentally made in Carinthia), electric piano and even cow bells were worked by the multi-faceted artist. Wonderful lyrical ballads, accompanied mostly by him just on the acoustic guitar, invite one to think. 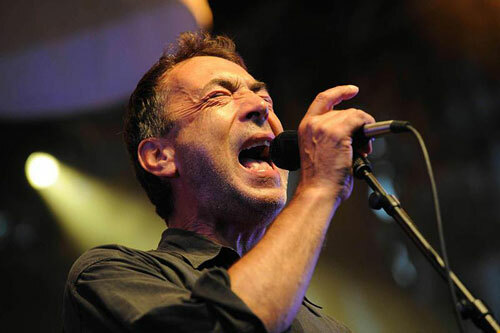 He puts his voice smoothly and nuanced to all his songs. And time and again there it is: the yodel. His songs and lyrics are sophisticated, socio-critical and tell of love and loss, joy and suffering. And he is a storyteller, philosopher and humorous compére who always introduces his songs and ruminates on the perfect day, saints and indians and special people, who are everywhere among us in different forms. He also made reference to the current situation in Carinthia, saying: "You Carinthians are all too well-behaved, that's why you all put up with so much." With new songs like the super hit Brenna tuats guat (from the current album EntwederUndOder) and old hits (Hiatamadl, Heast as nit) he thrilled his audience, who swung in time, thronged to the stage and only let him depart after many encores. As farewell he then sang the Carinthian song Wann du durchgehst durchs Tal together with the fans. Hubert von Goisern made a stop on his "Brenna tuats Tour" in Bolzano on Friday evening. "You're different from the Bavarians and the North Tyroleans," Goisern said to his South Tyrolean fans, who answered with cheers. Goisern had been heard last summer in Bruneck. Now the exceptional Austrian musician was providing a great atmosphere in the Bolzano Stadthalle. The musician from Salzburg thrilled with hits like Brenna tuats guat and Indianer from the current album EntwederUndOder, but long runners like Hiatamadl and Heast as nit weren't missing either. The concert hall wasn't quite full, but the South Tyroleans clapped and sang along and showed themselves to be true Goisern fans. From young to old - almost every age group was represented. And the vocally powerful Goisern too showed himself to be as multifaceted as always: on his album he combined different musical styles - from blues to country. On stage he presented himself as a thoroughbred musician, aside from the accordion also taking up the harmonica, guitar, Jews' harp and cow bells. As a farewell for the South Tyrolean audience, which included guests from Austria and Germany too, there was one more group-sung yodel. 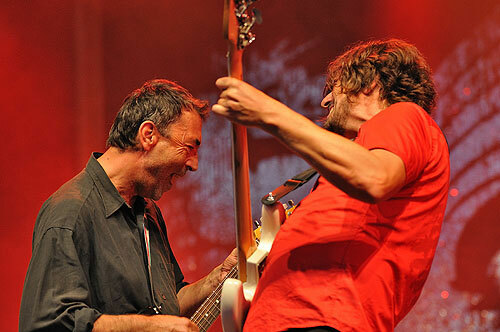 On 18.10.2012 at 8pm on the dot, Hubert von Goisern came on stage with his band at the Rotax Halle Wels. They were welcomed by cheers and loud applause from around 3000 fans. 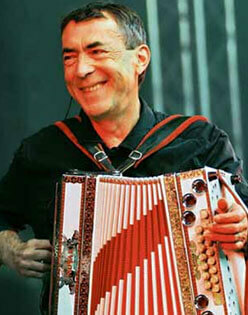 Without hesitation Hubert von Goisern began straightaway and elicited atmospheric sounds from his Styrian accordion. 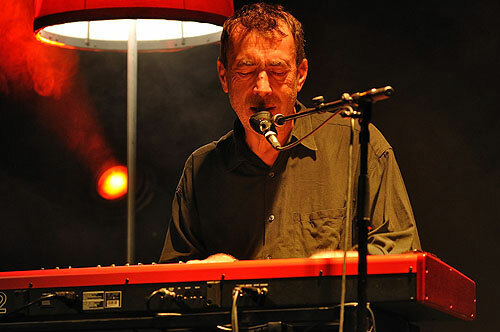 Hubert von Goisern presented hits from his current album as well as a number of older songs. Even before the halfway mark there was a goosebumps feeling, as pretty much all the hands in the well-filled hall clapped along to the rhythm of the music. It was also impressive how the audience sang along to all the hits. When it came to his number one hit Brenna tuats guat he was almost outsung by his fans. During the hit Weit Weit weg Hubert von Goisern let the audience sing the refrain once on their own and everyone in the hall sang along enthusiastically, sounding like a first class choir. The atmosphere was simply amazing! As in previous concerts there were also a number of different instruments being played, like for example his lap steel guitar, Jews' harp and cow bells. He is a storyteller and poet, curmudgeon and linguistically gifted entertainer, thoroughbred musician and multi-instrumentalist. He rocks out, yodels, whistles, sings, screams and prays to various saints on stage too: Hubert von Goisern, who with his band left his calling card at the Dortmund FZW on Sunday. It took no more than two of his more than twenty songs performed on this evening to break the ice with the Westphalian fans, for not just the introduction to the song Indianer, who "are to be found everywhere and in all forms, as they are simply special people", as as part of their integration they also sometimes have bald heads now and walk around quite normally, but the whole song provided swinging entertainment. One or two language barriers open up for the many people in the not quite sold out FZW, although von Goisern, born as Hubert Achleitner, is speaking "just German". Accordingly the protagonist performed the musical I vasteh di nit (I don't understand you). Ample strong dialect, but the singer-songwriter has a solution. "There are Austrians here too, if you don't understand something, just ask them", he suggests. But only the songs required attentive listening, the stories were understandable for everyone and so he entertained with all kinds of knowledge. For example, he tells the people of Dortmund that their patron saint is Saint Reinoldus, patron saint of stonecutters and not, as a heckler says, the BVB Dortmund football club. So developed an extremely relaxed, varied, harmonious evening, in which the musician, aside from his many humorous messages and stories with their comedic and entertaining elements, also presented his instrumental spectrum. Whether electric piano, various guitars, Jews' harp, harmonica, his trademark accordion or cow bells, barely any instrument is safe from him. Between joyful yodels, pure rock music, melancholy and blues, the band jumped about like dervishes, their enthusiasm never waning. Whether one wished for a Mercedes, intoned the homage to his hometown of Goisern, said Lebwohl (farewell) early, or described Leben (life), the gracious listener could not help but see: Brenna tuats (It burns). In many ways. Then it came, if it had indeed ever been the case, that von Goisern was Neama bang (never uneasy) and after a few encores he left behind a thrilled audience. Dortmund. When there's yodelling on stage and an accordion is cuddling up to an electric guitar and the German word for songs, "Lieder", becomes "Liadl" - then it's Hubert von Goisern at work. On Sunday the alpine rocker from Upper Austria rigged up his musical living room in the FZW, with cosy standing lamps, nice conversations and a little house music. Loud house music, mind you, with echoes of the Balkans, blue and brass music. But just a moment ... - 60? The man is going to be 60 in November? And has been on stage for more than 30 years? It's scarcely to be believed. 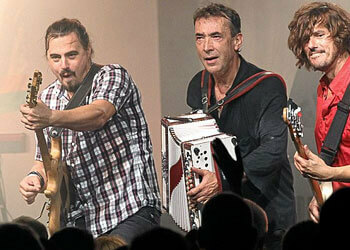 The alpine rocker and his three (much younger) musicians are so fresh, so unspent, so unrigid. Still having so such fun on stage after so long as a professional musician shows real passion. There's always a mischievous grin on the lips and sparkling irony in the eyes. And Hubert von Goisern doesn't just love the microphone, but his audience too: time and again he reacts to calls from the crowd. In particular he speaks more than once to his compatriots, a number of whom had made the pilgrimage to the FZW from a the little Austrian enclave in the Ruhr region. If only you could understand what he sings! For as is right for a proper Austrian, understanding the language doesn't always work out here. It should be fine with a bit of goodwill, he says. It's just German. Yeah, yeah, sort of. But it is exactly that which makes the attraction: anyone who isn't one of the confirmed longtime fans and doesn't understand the lyrics straightaway still knows what they're about. Listen. See. Simply feel. And even without music it could have been a decidedly entertaining evening. In his chat between the songs, Hubert von Goisern showed an incomparable double talent: a talent for music and cabaret in equal measure. While with other musicians one might be wanting the nonsensical flood of words to end soon, one could have listened to von Goisern for hours in his explanations of modern Indians, strange Bavarians and St. Reinoldus, patron saint of stonecutters. "Yeah? Do you know your saints?" He taught the people of Dortmund a little something. As the last encore the musicians gave everything once more - a cappella mind you. Proving that in Upper Austria even the drummers can sing flawlessly. Or, as I said before: A Woansinn - amazing. The song Heast as ned was played late in the evening as an encore on the new programme Brenna tuats guat. The concert has flown past. The entertainer Hubert von Goisern spoke to the audience before the song: "When you let yourself into singing, it can't sound wrong. When you don't sing along - as I used to do too out of defiance when someone on stage was trying to get the audience to sing along - you're just annoyed later, as soon as you're standing outside the door after the concert." Hubert von Goisern managed with his band from Upper Austria to carry away the audience in Schaan. 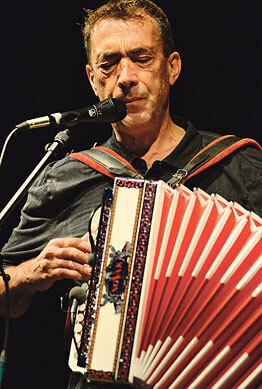 Hubert von Goisern's musical path led from trumpet to guitar, clarinet and harmonica to Styrian accordion. He only began to teach himself to play this much later. He sits at the keyboard too, to bring forward proof of his musicality - not to forget the juchitzers and yodels that sound from the stage. Hubert von Goisern is a model of joy in playing music. This joy inevitably had to be passed to the audience. As he told the story of how he had sinned against his clarinet by not playing it and wanted to make up for this, his talking went overlooked the melodiousness of the instrument - which "presents a mean mechanism with its numerous keys for a few fingers" - , which astonished the listeners. The evening at SAL with Hubert von Goisern, accompanied by his band (bass, guitar and drums), was from the first second an courtship of the public for them to find a form of expression themselves full of relish with instruments, singing and lyrics. Alpine rock is the form that von Goisern found after long journeys and musical experiments. Hubert von Goisern isn't on the winners' podium as often as top surfer Kelly Slater, but the Austrian musician holds his on the waves of alpine rock like no other. Now he's on the perfect ride again: he has a number one hit with Brenna tuat's guat and with it topped his hitherto biggest success he had had nearly twenty years ago with his debut single Koa Hiatamadl. He can approach his show in a relaxed manner. It certainly wasn't the first as good as sold out concert on this tour that Hubert von Goisern played slickly and full of joy. The alpine rock concept, which he has successfully adapted for himself, still works without complaint. The accordion provides a measured pinch of the exotic in the rock quartet and the snappy melodies are repeated by the rocking guitar. It's not innovative any more, but innovation is only in the rarest cases the catalyst for success. Hubert von Goisern knows what his audience wants and for a good two hours offers them excellent rock entertainment. 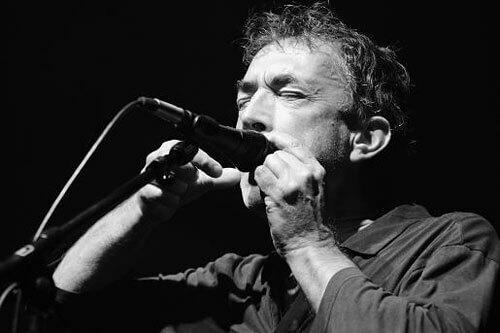 He changes instruments - from Jews' harp to accordion, lap steel, guitar, clarinet and keyboard - and with them the tone and atmosphere of his songs. Hubert von Goisern has not come to surprise his listeners. 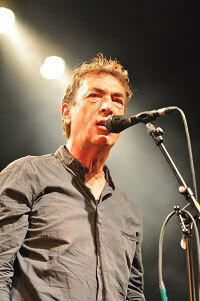 He consistently calls upon the familiar - with both the references to folk music and the rock interludes. And even with the now mainstream mixture of the two genres he stays on the safe side. So Hubert von Goisern remains on the well-worn paths and gives the audience what they expect - and extremely gratefully receive. 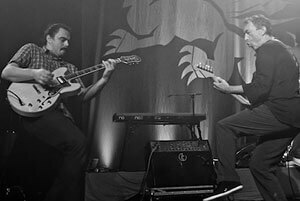 His young band is sterling, guitarist Severin Trogbacher often plays into the spotlight with his solos. After the lyrical introduction the quartet shines with powerfully played rock and blues rock, at times funky and then with powerful slides. He is forgiven for the contemplative-lyrical part being too long. The fact that he seems momentarily like Ostbahn-Kurti in a Springsteen cover indicates the Upper Austrian globetrotter's stamina: after two hours - with a number of encores already behind him - he stands on stage alone with his guitar. His audience is still spellbound. As early as 3pm the first concert spectators arrived in the world famous lake town of Hallstatt and took the opportunity to look around in summer temperatures, have a coffee or an ice cream. Hubert von Goisern also turned up at this point and despite being in a hurry, took the time to sign a few autographs for his fans. The gates opened at 6.30pm for the concert at the wharf. The concert had sold out weeks ago and so the square was well-filled with people of all ages. Many people took advantage of the gorgeous setting at the lake and watched the concert in romantic style from a boat. Finally the time came at just past 8pm. 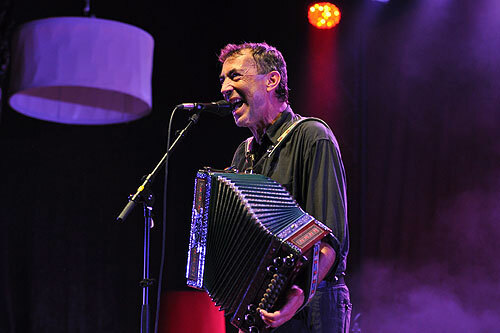 Hubert von Goisern entered the stage with his band and was welcomed with cheers by his fans as he began to play his Styrian accordion right away. During the concert his lap steel guitar, Jews' harp and cow bells were also brought into action. The fans were absolutely thrilled and were carried away ever more with each hit. Until of course his number one hit Brenna tuats guat rang out. Then there was no holding back even the quiet listeners. Between his hits Hubert von Goisern heated up the atmosphere even more with funny stories from his life and loud laughter rang through Hallstatt. He did it again, as at all his previous concert, managing to impress and rock the audience and making for an atmospheric evening. Wild applause for the star from Bad Goisern! Hubert von Goisern gave the final open air concert of the Brenna tuats guat Tour 2012 in Hallstatt on Sunday 9th September 2012. 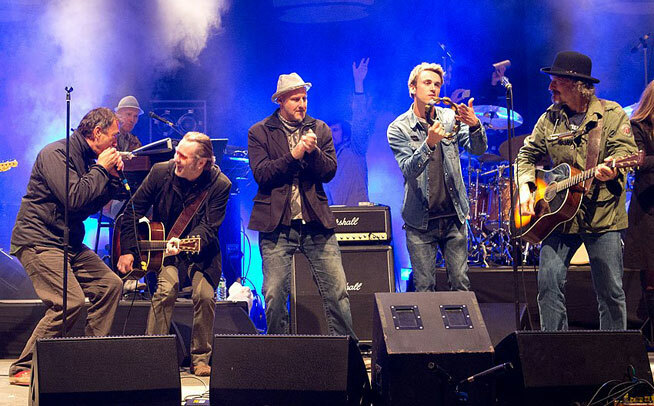 The concert had sold out in the shortest time and more than 1600 people came the centre of the world heritage town. The ambience at the wharf between the two churches and of course the music, stage and light effects, as well as the musician's warm and witty contact with his fans thrilled the audience. Alongside the brand new hits Hiatamadl was a must too. Lienz – [...] With the Upper Austrian thoroughbred musician Hubert von Goisern the organisers of the Dolomitenmann brought a special act to East Tyrol, as "an anniversary present from Didi Mateschitz to my father" said Niki Grissmann, son of the Dolomitenmann founder Werner Grissmann. It was the only free concert that Hubert von Goisern is giving on his Brenna tuats guat tour. Visitors from near and far took the opportunity in pleasant late summer temperatures to be there live with free admission when the chart stormer with the multifaceted voice powerfully played the buttons of his accordion. The gates were closed long before the start of the concert, " The Lienz Hauptplatz had to be closed at 7.30pm for safety reasons; it can't take any more than 3000 people, said Niki Grissmann after the event. Another 3000 fans didn't make it in time, said Grissmann, and rocked to the sounds of the charismatic musician outside the grounds. Brenna tuat's guat will no doubt burn in the minds of the East Tyroleans for a long time yet. For world musician Hubert von Goisern heated up the audience in Linz with the only free concert of his current tour. 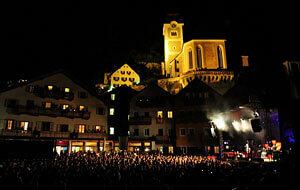 The Hauptplatz had to be closed as early as 7.30pm for the concert, a highlight of the Dolomitenmann event. For safety reasons the square can take no more than 3000 people. Another 3000 people cheered the artist from outside the square, including from Johannesplatz. 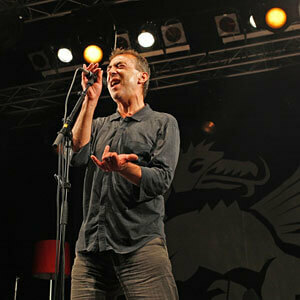 The edgy alpine rocker played a strong concert in Braunschweig. At first his standing room requirement caused annoyance, later euphoria reigned. Braunschweig. He used to be miffed when the audience sang along: "Just because you've paid for a ticket, don't think that it's going to be a singing lesson." Someone bothered him one time, he left the stage. Today Hubert von Goisern is completely relaxed. He answered many heckles at "Kultur im Zelt" on Wednesday - and now with backliner Hannes even has an animator who encourages the clapping along and shouting. The concert was a triumph. There was a little annoyance before the start. Many didn't want to accept that half the audience would be standing. Folding chairs were brought in from outside; some returned their tickets for a refund. "The split was a compromise. I wanted everyone to stand. I understand when someone wants to sit, I just don't accept it," von Goisern later commented laconically. Standing was actually a good choice. The first half of the concert was a fierce rock concert: Suach da an andern with howling electric guitar and driving Jews' harp rhythm; I versteh di nit drawling blues rock with lap steel guitar; Indianer an original mix of 60s western flair and a solo with cow bells big and small. The almost 60-year-old works his accordion so energetically that he is dripping with sweat after just ten minutes. 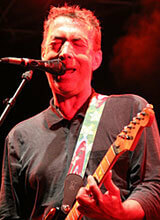 His eyes are mostly closed as he plays, his facial expression as if contorted with pain. The instrument given to him by his grandfather in 1986 was the epitome of the eternal past. Drunk on schnapps he wanted to rip it apart - and in so doing discovered a new way of playing. Since then he has experimented, played music intuitively, mixing styles. And often writes simple, but not simplistic accompanying lyrics. His current album Entwederundoder, which he performs in its entirety, tells the stories of the end of a relationship and of going out into the world, of melancholy memories, life that passes uneventfully by and of difficult people. Wistfulness, anger and joie de vivre. The audience honours each song with great applause - and celebrates hits such as Goisern and Heast as nit. At the end the Austrian number 1 hit Brenna tuats gut is stretched to a lively ten minutes. The atmosphere is so euphoric that the almost two hour concert is followed by a half hour encore. After an a cappella yodel together with his excellent band, Hubert von Goisern puts his hand on his heart. "That was wonderful", he says. And you have the feeling that he doesn't say that at every concert. Burghausen. The Austrian alpine rocker Hubert von Goisern put in a persuasive performance for the 2700 people at his concert at the Waffenplatz at Burghausen's fortress. The organisers had made it standing room only and so many fans saw little of their musical idol. But the engineering was set up very well and Goisern's mixture of alpenglow and good rock flooded ears in the most pleasant way. Together with his highly professional band the experienced player took people on a journey through his new CD. The concert was a mix of rock and ballad numbers and this refreshing combination of different styles lets time fly very quickly. The Upper Austrian sang a homage to his hometown of Bad Goisern, "Goisern, oh Goisern" ringing through the ancient walls. This old melody was wrapped up in the artist's new songs and the enthusiastic fans wandered between music to make you think and sounds that make your blood boil. Mind you, Goisern's lyrics almost do this on their own. When he sings "I want to live", he's speaking the mind of most people. Living and enjoying according to one's own plans, free of constraints and free in thought. Just like the Goisern ballad, which is a cover of the standard Georgia on mind, the musician combined the unforgotten Janis Joplin's Mercedes Benz with Austrian sounds. The pieces that most people were waiting for rounded off the concert. Brenna tuats guad - his current big success - marked the official end point and Heast es net kidnapped the listeners now almost completely lost in thought as the last piece of sweetness. The time flies fast. Not just the 110 minutes with Hubert von Goisern. ENDERNDORF - "Lieder am See" has become the benchmark for perfect open airs in the region: at the second event in Enderndorf everything that could make the festival attendee's heart beat faster was on offer: great music, beautiful summer weather without a cloud in the sky, refreshing opportunities to swim, a huge beer garden and numerous food stands with international specialities. Around 3000 people enjoyed the musical marathon with four bands in the best conditions. The beginning and end of the day lay in alpine hands. The trio Ganes from South Tyrol opened "Lieder am See" with quiet sounds and beats, Hubert von Goisern from the Salzkammergut made the festival grounds shake into the night with his grooving alpine rock. 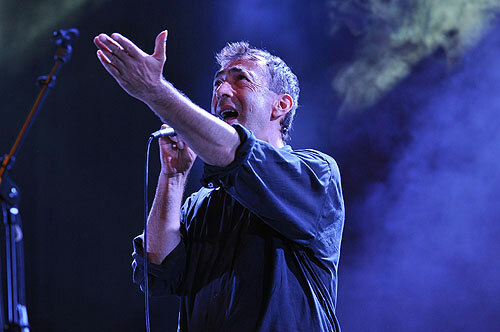 [...] As headliner of the festival at Lake Brombach, Hubert von Goisern demonstrated most impressively what incredible power modern rock music can take from traditional folk music: the songs from his new successful album Entwederundoder like Brenna tuats guat or Indianer seem almost furious, stirring up, decrying, wanting to be far more than alpine shallow pop from TV shows. 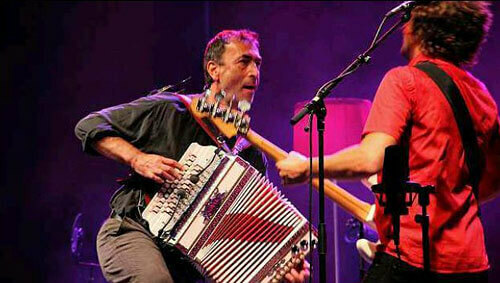 The instrumentation is concentrated on guitar, bass, drums and Goisern's ever-present accordion. In addition he gives new room to the Jews' harp or cow bells - as well as the once spurned Hirtamadl. This hit once started the "Goiserer's" enormous wave of success, on which, after periods of calm, he is now swimming again - with a more impressive and intense stage presence though. "It's good that he has found his way back to his alpine rock," one festival attendee says happily. Fans of Hubert von Goisern stood closely packed long before the start of the concert at Burghausen fortress. 3000 had come and made the Goisern show the best-attended event of the Burghausen concert summer. 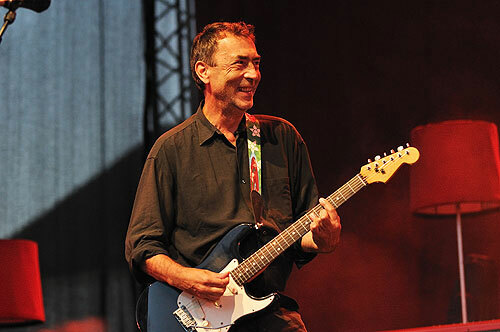 Differently from previous years, when von Goisern usually stood on stage with a large group of musicians, this time the 59-year-old was accompanied by only a trio in the classic rock lineup of Alex Pohn (drums), Helmut Schartlmüller (bass) and Severin Trogbacher (guitar). The first part of the evening was accordingly rock-oriented, thrilling the younger people in the audience in particular. Von Goisern kitted out Janis Joplin's Mercedes Benz with Austrian lyrics and the quartet transformed the jazz standard Georgia into a declaration of love for Hubert's hometown of Goisern. Due to the small lineup of the band, von Goisern was able to use his diverse instrumental arts. He played not just his trademark Styrian accordion, but acoustic and electric guitars too, slide guitar, piano, cow bells and Jews' harp. Since von Goisern doesn't just include top class musicians in his band, but has also made sure that they are all good singers when bringing them together, there was often extra applause for the multi-voiced vocal passages. Though Hiatamadl was not included, boiling point was approached in the second half, when the songs based on folk music were unpacked. The Austrian said goodbye to his audience for the first time with Brenna tuats, Goisern's biggest hit of recent years. 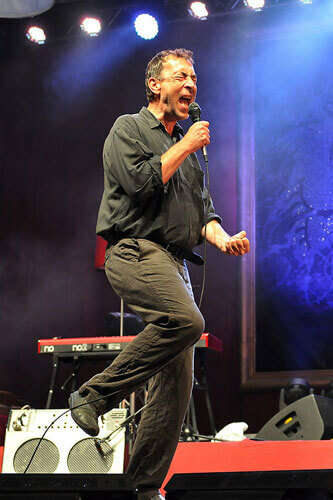 The 3000 fans loudly demanded encores and von Goisern did it in style, adding more than another half hour. Heast as net and Ganz weit weg sounded out over the fortress, strengthened by the many thousands of voices. But even that wasn't enough. The quartet had to return to the stage again. Von Goisern thanked the fans for coming, singing along and dancing, before the band finally said goodbye with an a cappella piece. Enderndorf am See. A more relaxed summer pleasure is scarcely conceivable: on the shore of Lake Brombach in Enderndorf at the weekend, the second edition of the "Lieder am See" rock festival was stage with 3000 people in attendance. Spalt's mayor Udo Weingart had a persistent permanent grin on his face on this glowing sunny Saturday. And he wasn't the only one touched by the feel good factor that day, despite the temperature well above 30ºC in the shade. Pop and rock in an ideal dose can have a beneficial effect too. [...] Hubert Achleitner alias Hubert von Goisern cannot and has no desire to curry favour. 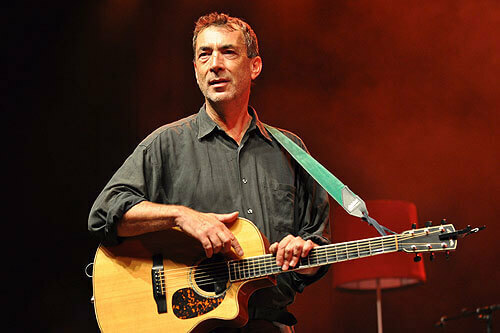 The Upper Austrian has returned to his roots and plays rock songs from his alpine homeland. The fact that there are predominantly ballads is confusing at first, but there is method: "The Goiserer" wants to tackle hard subjects in terms of content, letting his fans listen and consider, be critical and militant. Brenna tuats guat, the first single release from the current album Entwederundoder, is a biting reckoning with an industry that misappropriates food stuff such as turnips and sweetcorn for the production of fuel and accepts famines along the way. Hubert von Goisern is without doubt on a mission. And doesn't bother with convention for a second, leaving the stage temporarily when a drunken person bawls during the songs. The consequence also has something to do with pride and self-respect. [...] Most of the pilgrims to the festival were there to see Hubert von Goisern. Certainly he kept the fans of alpine rock on tenterhooks a little after Wingart's introduction, but then he really let rip like a firework. 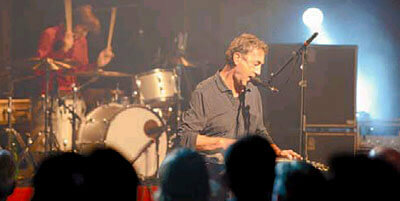 Songs from his new album EntwederUndOder include both classic and new elements. The melancholy in substantial ballads alternates with the finest rock music. Hubert, as people called to him time and again from the crowd, shows himself to be quick-witted, cryptic and armed with a confident feeling for the situation. An unconventional light and stage show enriches the turbulent scene on stage. Spalt/Enderndorf. [...] Before the hit of the evening, Hubert von Goisern, entered the magnificent stage in front of the backdrop of the great Lake Brombach, there was the opportunity for festival guests to take a tour of Lake Brombach with the bit trimaran, to cool off in the lake, or simply enjoy the marvellous summer sunset from the lovely sandy beach. Afterwards red lit up the stage, the Spalt mayor having charmingly introduced the highlight of the festival: Hubert von Goisern instantly thrilled with the songs of his album Entwederundoder and of course with the current hit single Brenna tuats guat. You notice straightaway that you're dealing with a professional entertainer here, who communicates with his listeners and presents the best music in different rhythms with his band. Great atmosphere til midnight. Hubert von Goisern was quite rightly the highlight of this holiday summer sun festival from Concertbüro Franken, which led you to forget all other holiday destinations. Kassel. The way he shouts it, the way he sings it. "I will leben" (I want to live), becomes his anthem and his audience in the sold out Kassel Kulturzelt joins in: commitment to a undreamt-of awareness of life. Not always just limiting themselves, taking a back seat. On this evening, on which the mountains and alpenglow are so close, the idea was there for a moment. Hubert von Goisern, alpine jack of all trades, lays the scent for it with loud, hearty rock and seductive melancholy. Accordion, harmonica, guitar and keyboard, this Hubert Achleitner from the Austrian town of Goisern, which he has honoured with his stage name, changes instruments like he does styles: he casually mixes together what apparently doesn't go together and then it's fine. 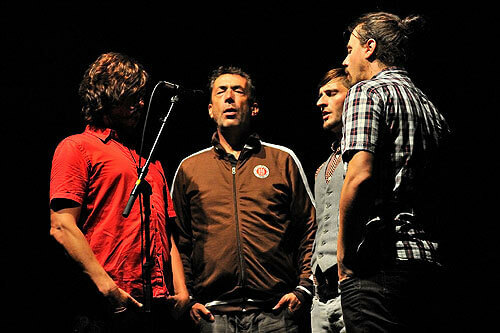 A mélange of rock and alpine pop, folk and emotive ballads. With his band, Alex Pohn (drums), Helmut Schartlmüller (bass) and Severin Trogbacher (guitar), the magician of sound kidnaps you into a world that is far from the people of North Hesse and yet in these two and a half hours is very close. If you don't understand the words, he explains to his audience with much charm and wit, then just fill in with your fantasies, what you want. It's simple with the Austrian. Entwederundoder is the name of Hubert von Goisern's new album, which he presents alongside other highlights from his repertoire: the lanky 59-year-old with the nature boy image, whose cheeky moderation is almost cabaret-like, sings and cries to driving and tenderly dreamy sounds into the hearts of his enthusiastic audience. With his current hit Brenna tuat's guat he offers the ultimate song on the contemporary subject of money, yodels into Goisern country to smooth accordion sounds, crashes into his Indianer song with hard rock rap, or with his adaptation of Janis Joplin's Mercedes Benz finds a completely new interpretation of the classic. After the earthily solid with yodelling, cow bell sounds and hearty "hey, hey" singing he spreads goosebumps with his ballads Weit, weit weg and Lebwohl. Goisern can be soft too. "Just don't descend into depression," says von Goisern, leading slickly into the dramaturgical change. 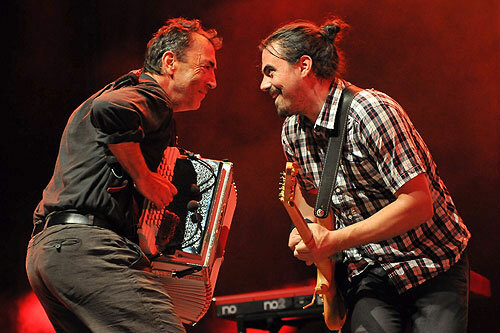 Then two instruments circle each other, the guitar and accordion, threatening, two musicians in a duel, performed challengingly, escalating - captivating. Energy and joy in playing that is transmitted and continues to have an effect. Euphoric applause and two encores. That's the way it is. 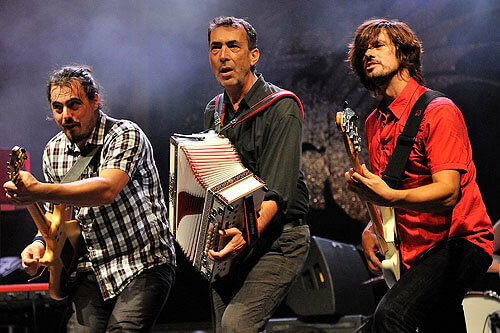 Everyone sings along to "Hiatamadl"
Alpine yodelling and accordion dabbling in competition with hard rock: Hubert von Goisern made 4000 listeners happy at the jammed full open air stage in Altusried. 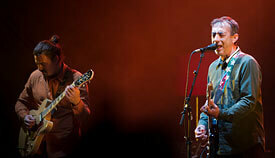 He is accompanied on his Brenna Tuats tour by a young three-member band of drums, bass and guitar. In earthy Austrian dialect, the alpine rocker from the Salzkammergut primarily presents the songs of his current album Entweder und Oder - a driving mix of alpine rock, rap, blues and jazz. The reflections on his musical past went down especially well on the clear summer night. The audience euphorically sang the lyrics to songs such as Hiatamadl. Many missed the vocal counterpart of former Alpinkatze Sabine Kapfinger in the tenderly dreamy Weit weit weg. Twenty years ago she had prompted Hubert von Goisern to establish yodelling as a stylistic device with the Alpinkatzen. He now takes her part himself: "Du warst wia der Sommerwind, der einifoahrt in meine Hoar, als wia a warmer Regen auf der Haut ... i spür no deine Händ im G'sicht und wia du mir ganz tiaf in d' Augen schaust ..."
The audience enthusiastically applauded current chart stormer Brenna tuat's guat: "A jeder woaß, dass des Geld nit auf da Wiesen wächst und essen ka ma's nit, aber brenna tuat's guat ..." In the lyrics Hubert von Goisern processes his thoughts on greed and money in general and criticises the events around the financial crisis. In summary: The singer with the Styrian button accordion, who once helped revolutionise alpine folk music, still suits the taste of his audience. In Altusried in any case he hit the bull's eye. "But as long as the music plays ..."
Where there's an accordion, it's mostly folk music that will be played. 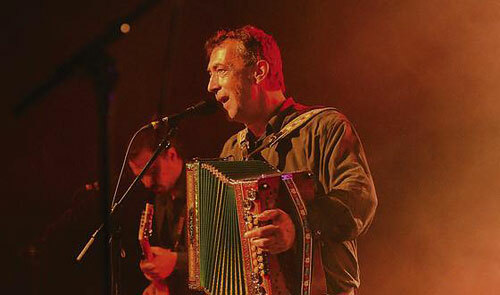 There were a few accordions in use at the weekend and were mostly used to play folk music. But you had to pay close attention to make it out. Hubert uses it when he wants to be emotional. Florian straps it on when he wants to put on a show. You can't imagine the Amsterdam Klezmer Band without it. Willi puts it on his lap when he wants to perform a good country dance. And for Marius and Yannik it's just part of the Zydeco. The hand organ, the accordion, the "Örgeli" was an oft seen instrument on the stages of the Jazz Days. Only jazz did nobody play on it, although that would work too. The ziehharmonika was used traditionally, unable to deny its close connection to folk music. Hubert von Goisern play folk music in his early days too. Not for long, because with his compulsion for the new he soon fell out with the established guild of his hometown of Bad Goisern in the Austrian Salzkammergut. 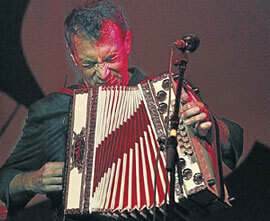 His first involvement with the accordion was fateful. He hated it as a young man, a gift from his grandfather, of course with the expectation that the grandson would think to play it. But the young Hubert Achleitner wasn't interested in learning, a love-hate relationship developed with this musical instrument, which gathered dust silently and admonishingly on top of the wardrobe. Until one day, "completely intoxicated" as he reveals, he ripped it from the cupboard and wanted to destroy it. But it didn't work, because the bellows were too tough. Relief went through the young Hubert and in two hours he mastered the accordion. Today a still growing international fan community is happy that the instrument withstood its owner's fit of rage. 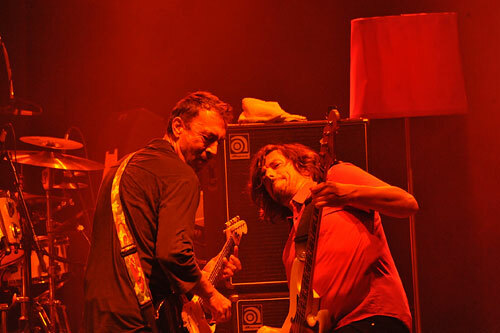 But rage is the emotion that still occupies the musician Hubert von Goisern. Over the years he has learned to channel his anger: "Everyone knows that money doesn't grow on trees and you can't eat it either, but it burns well. But we stoke up the wheat, the turnips and maize and if we keep on stoking, it'll all go to hell." When "HvG" sings about life, expressions from Upper Austrian farm economy become biting socio-criticisms: "Push and pull, pray or lie, drink, eat, forget loads. But as long as the music plays and the jug is filled with beer, but as long as the music plays and the jug is filled with blood, sit a while and let out a juchitzer." In thrilling style von Goisern celebrates his songs, the concert should be a party and the locals perhaps don't understand a lot anyway, the Austrian speculates: "Guuglz es muan!" - One should google it the next day and he grins mischievously, because he knows that not every Upper Austrian idiom has made its way into the global network. Perhaps it's better that way. "The Goiserer" once had problems in his homeland with his no-nonsense talking, today he is a star in the German-speaking region. He was once a determined autodidact, he is now a multi-instrumentalist, tirelessly assembling music styles like the folk music from his valley with waltzes, rock, two step and blues. 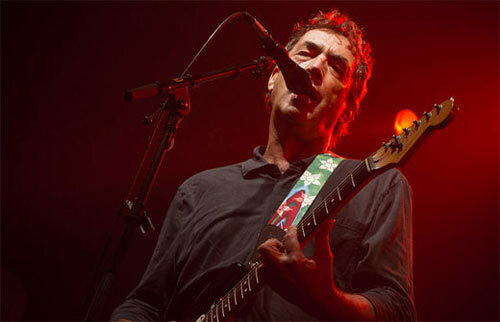 He was once an angry young man, this year the matured musician will turn 60. His anger still grows through his songs. But he has turned it for the good, it has become an emotional, thrilling and thoughtful statement on a broken world: "Lord, buy me a Mercedes Benz, oh Lord, a Daimler and then I'd be happy!"